On the eve of 21 September, I sat glued to democracynow.org — the only media venue I could find covering the story of Troy Davis, who had been scheduled for execution at 7:00 p.m. for the 1989 death of a Savannah police officer. In Jackson, GA, a quiet crowd gathered in demonstration. It was 8:15 p.m. and Mr. Davis’ appointed time of death had come and gone and the big, cumbersome wheels of democracy were still spinning as Davis’ attorneys requested the US Supreme Court to intervene. That was when my nine year old son Ryan picked up his desk chair and placed it next to mine. That was when the bombardment of questions began — many that I found difficult to answer. Why are they going to kill him? He was convicted for the murder of a Georgia police officer twenty years ago. How are they going to kill him? Lethal injection. They strap him to a gurney, place IVs into each of his arms, and inject him with drugs that will stop his heart. Will it hurt? I’m sure it will hurt; though I imagine waiting twenty years on death row is more painful. How long will it take? A few minutes. Did he really do it? He was convicted by a jury of twelve based on witness testimonies. However, since his conviction, seven of the nine witnesses have come forward saying that they had been threatened and intimidated into accusing him. That means, the witnesses lied to the jury, who convicted him on false testimony. Now those witnesses claim Troy Davis is innocent. If he’s innocent, why are they killing him? The jury found him guilty and he was sentenced to death. All we can hope for is that the US Supreme Court will review the situation and stop the execution. Can’t they give him another trial? Everything hinges on the Supreme Court’s ruling. If the Supreme Court doesn’t step in, the wheels of justice are already in motion. 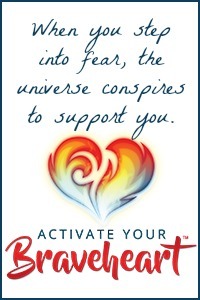 It will be impossible to stop. What do you think Troy Davis is doing right now? I think he’s tired of waiting for a death that was promised twenty years ago, for a crime he maintains he didn’t commit. As this conversation pursued, we kept our eyes on democracy.org where 35,000 viewers from all over the world were tuned. Amy Goodwin was talking to Benjamin Jealous, President, NAACP, who quoted Gandhi: “An eye for an eye makes the whole world blind.” We saw people wearing I AM TROY DAVIS T-shirts. On the democracynow.org site, Twitter feeds were blasting. While the scene in front of the prison where Davis was being held was serene, the social media community was in a frenzy. “Can I stay up with you?” Ryan asked, as the clock approached 9:00 p.m. He reluctantly picked up his chair and placed it in front of his own desk. His face was drawn. I guessed he was thinking of a good reason why he should be allowed to stay up past his bedtime. “I am Troy Davis,” he said to me before leaving the room. When I finally closed my browser to the pain of reality at 11:15 p.m., I wondered how I would tell Ryan the news the next morning. I knew it would be the first question he would ask and I could already see his face, bright and hopeful. When the next morning came, Ryan’s first question was not whether Troy Davis lived, but rather, “What time did he die?” He knew. No body had to tell him. Somehow he knew instinctively that the system was broken and that, for Troy Davis, there had been no hope. “He died at 11:08 p.m.,” I answered. “But that’s not fair,” he said calmly. “No, it wasn’t fair.” I echoed. When I reflect on how this event has made me feel about my role as a parent, it’s my son’s words that still echo in my ears, I am Troy Davis. 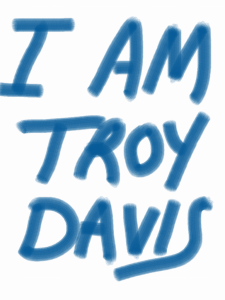 We are all Troy Davis, whether we choose to believe it or not.